Chocolate Peanut Butter Poke Cake - peanut butter cake, soaked in chocolate, topped with chocolate frosting & Reese's!! Peanut butter chocolate overload! Chocolate and peanut butter is one of my favorite flavor combinations. I can not resist a Reese's cup or a Butterfinger. I also can not resist this cake! Peanut butter cake, drizzled with chocolate syrup, topped with Reese's and chocolate frosting. YUM! I love poke cakes. They are so easy to make and can be made several days in advance. The cake actually tastes better the longer it sits in the fridge. Make sure you have a glass of milk handy. You are gonna need it to wash down this amazing cake! Prepare cake according to package directions, adding in 2/3 cup peanut butter before mixing. Bake cake in a 9x13x2-inch pan. 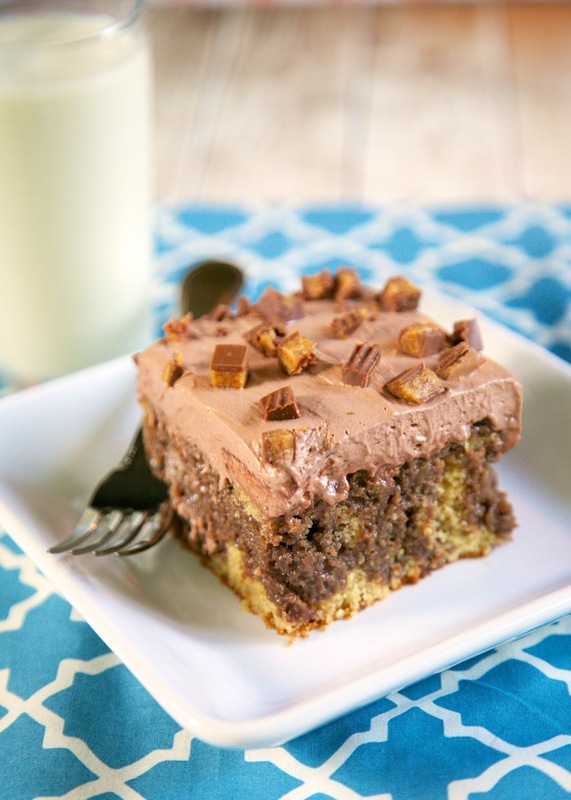 While cake is baking, mix milk and chocolate syrup until well blended. Chop Reese's cups into small pieces. Sprinkle half of the Reese's cups over cake. Carefully combine chocolate frosting and Cool Whip. 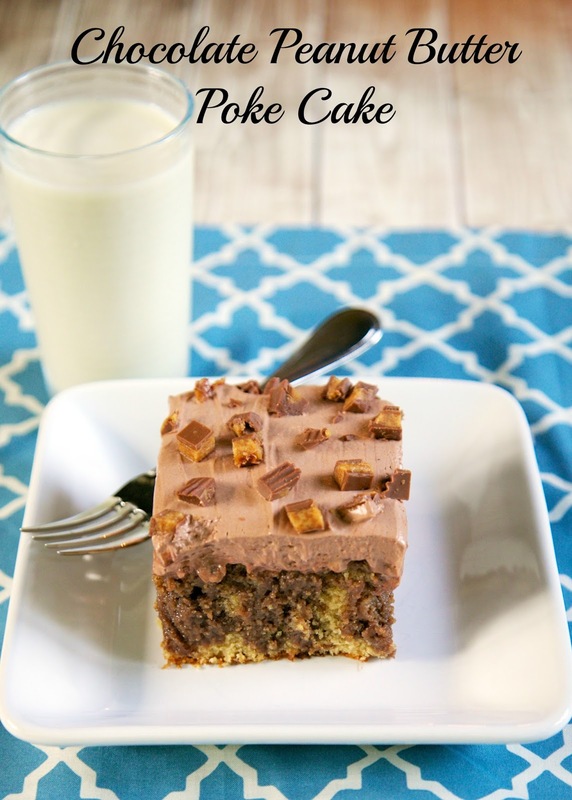 Spread over the top of cake, then sprinkle the remaining Reese's cup on top. Chill. Tip: I like to refrigerate the Reese's cups so they chop easier. I MUST make this TODAY! OH. MY. GAH. That looks so flipping good! Must. make. Gosh. this is such a delicious looking cake! Oh chocolate and peanut butter is my favourite combo! This cake looks delightful! I'm happy yet devastated to admit that I could eat A LOT of that cake. It would really be embarrassing. I would have a hard time resisting this delicious cake! Yum! I made this for my son's birthday, it was delicious. I think I did something wrong because there was a ton of chocolate sauce in the bottom of the pan. Any ideas what I can do to prevent this? Is this cake okay to make a day ahead of time, or is it best made and served on the same day? You can make it ahead of time. It will be good for several days. I made this cake for my mom's birthday and it was AMAZING. It was definitely a hit with everyone at the house. I put it together Friday night and I think that helped the milk/syrup mixture really set in to the cake. LOVE this. cant wait to make this !!!!! I know this is an old post but does the cake need to be refrigerated afterward? I figured it would considering the cool whip? Melissa - I do usually refrigerate the cake. Enjoy! I make this cake every year for my son's birthday. Everyone loves it! Very simple yet so yummy.